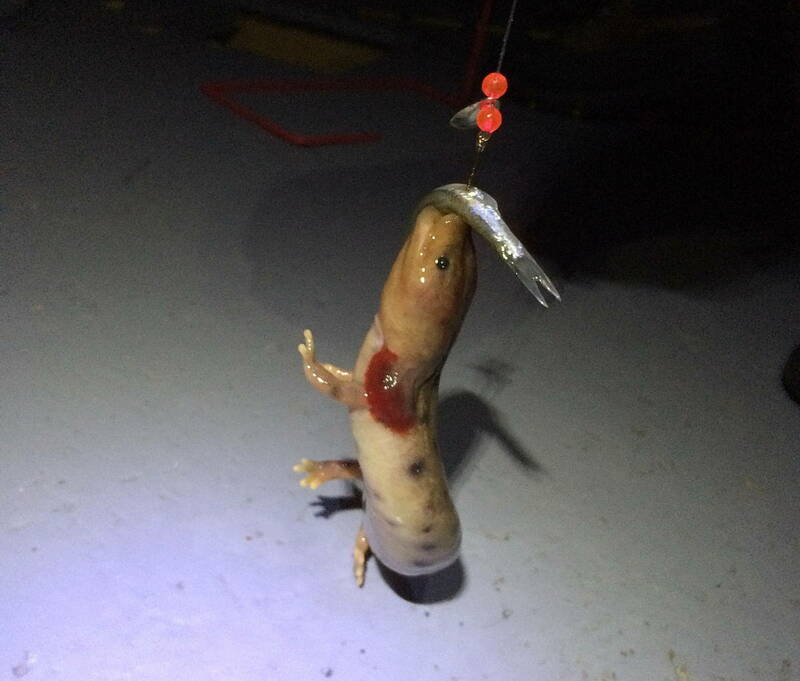 When my son forwarded photos of a Mudpuppy that he and his buddies pulled from Lake Nipissing in Ontario while ice fishing, I thought “how interesting” but gave it no further consideration. I did not realize how uncommon these little aquatic creatures are. 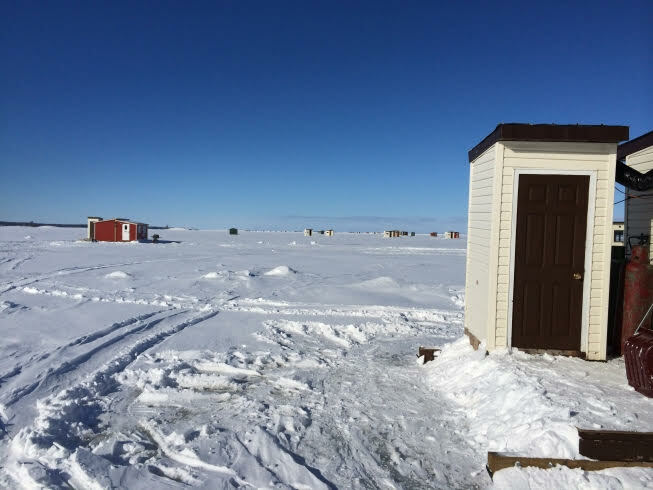 My son’s ice fishing expedition began at daybreak when the men were transported in a sled towed behind a snowmobile to a fishing hut. Oodles of supplies were along for the ride, too. 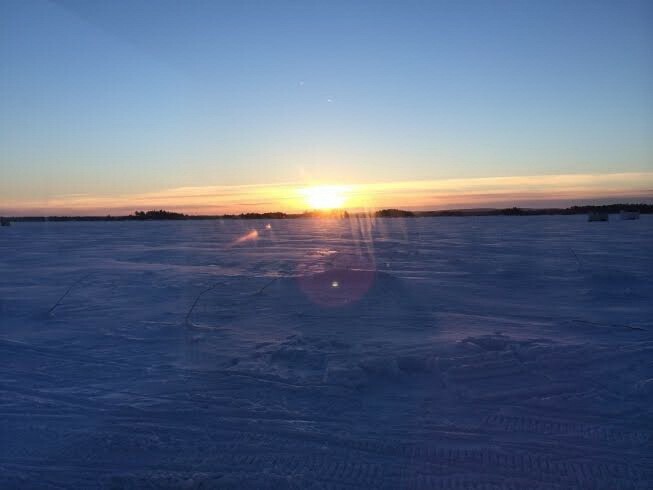 The weather was insanely cold and windy over the next three days, he said, with temperatures ranging between -33 Celsius to -41 Celsius with the wind chill. 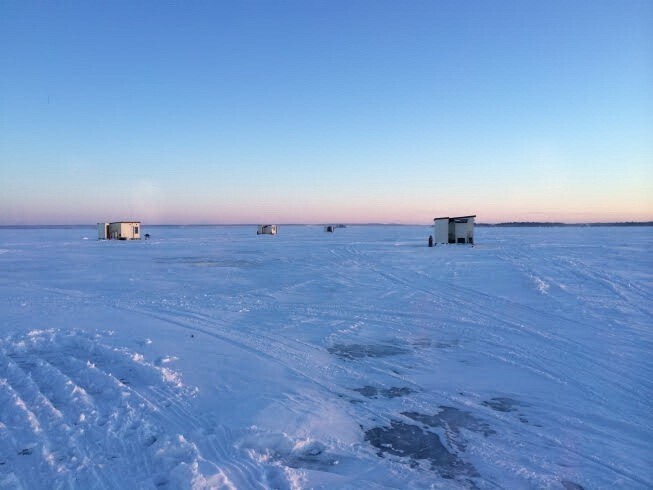 My son and his buddies found themselves a couple of kilometers offshore in the middle of Lake Nipissing. but the washroom was an outhouse with a very chilly seat! 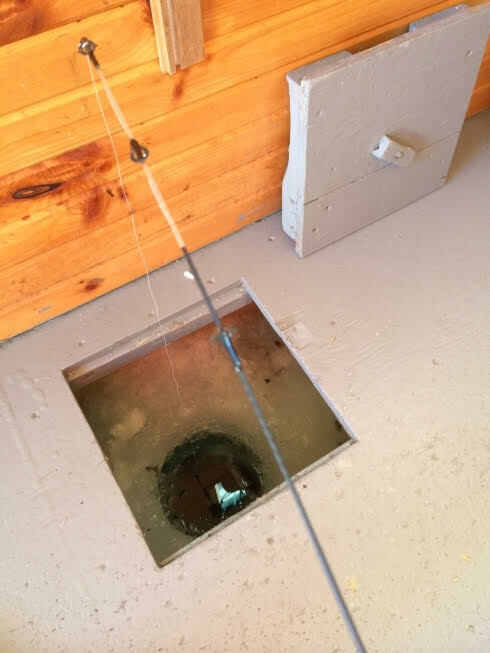 This is a view of one of the fishing holes beneath the floor of the fish hut. The ice was over 18 inches thick at that location. Given that fish don’t feed as actively when it is extremely cold, still my son and his buddies did not come away empty-handed. In all, they caught a selection of Perch, Walleye and Sauger. With three firefighters in the group, and a gas range and barbeque for cooking up the catch, the group ate well. When one of the guys pulled up a Mudpuppy, he had to educate the other men as to what they were looking at. This rarely seen aquatic salamander breathes underwater, has legs and walks on the bottom of the lake. “They are a protected species”, he said. 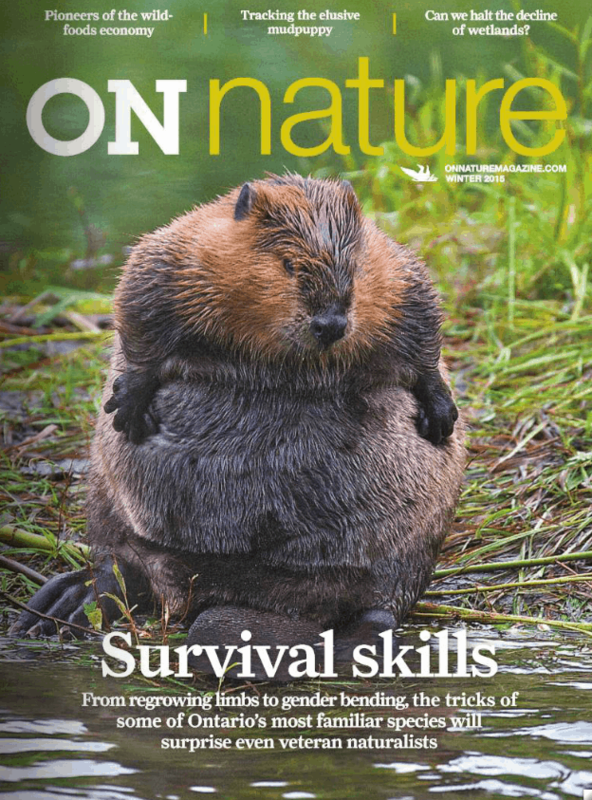 It wasn’t until this March, two years later, that I came across an article about Mudpuppies in the ON Nature magazine 2015 Winter edition. That is when I became aware of just how special my son’s sighting had been. These elusive amphibians are Canada’s largest and only completely aquatic salamander. Sometimes called “snot otters” because of their slimy skin, a Mudpuppy’s most noteworthy characteristics are the bushy red external gills that float freely around its blunt head like an Elizabethan collar when the creature is submerged. Mudpuppies range between 10-20 inches in length, have stubby legs and four distinct toes on each foot. 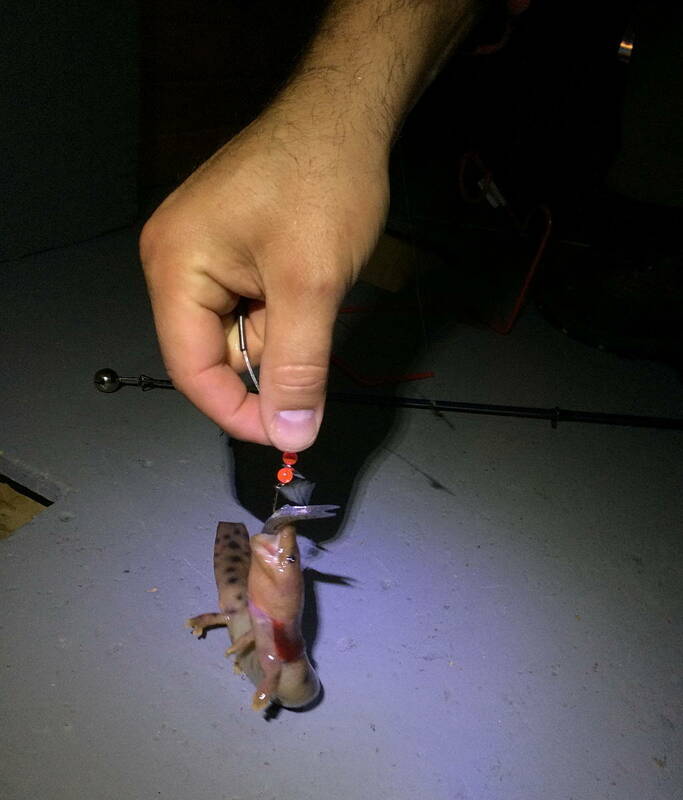 Primarily feeding at night for snails, worms or crayfish had this specimen selecting the tiny bait fish for something good to eat. 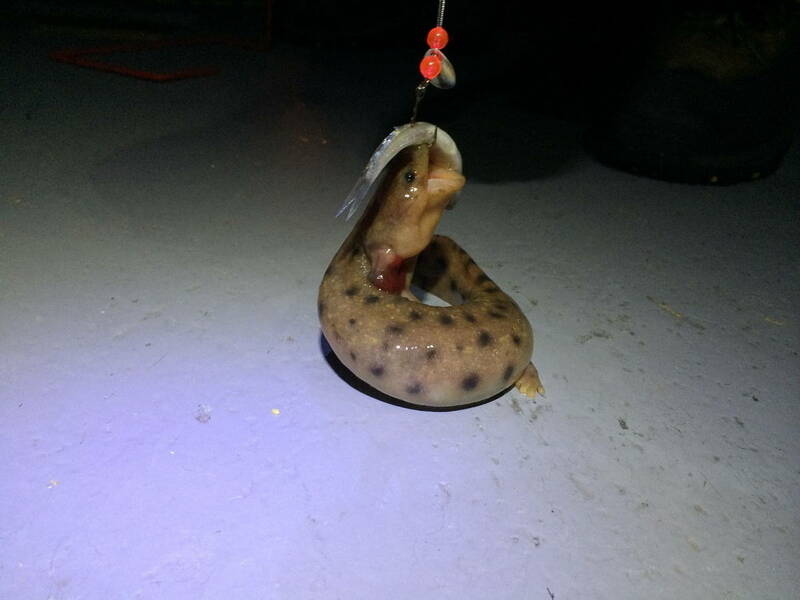 Here is a very short video that demonstrates how a Mudpuppy moves about. 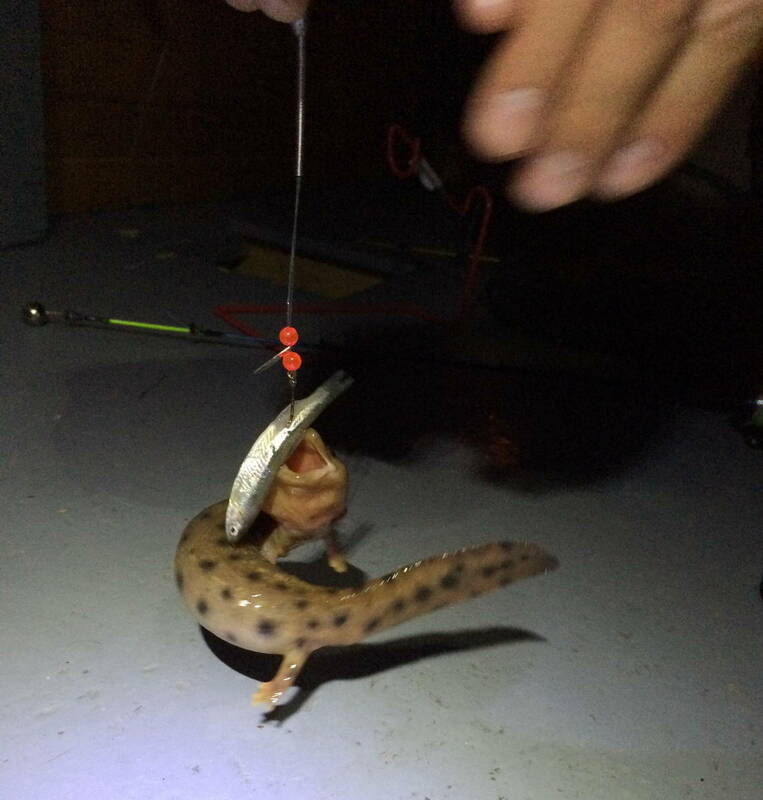 Recognizing how vulnerable the delicate amphibian was, the fishermen promptly helped it back to the water so it could return to the bottom of the lake. Hopefully, this little amphibian can see its way clear through the 30 years that make up its life expectancy.